I am getting an error when viewing a zipped code coverage report of 'Unexpected error'. If I don't use a zip file and and output to a path the report works fine. Also if I go directly to the zipped artifact and browse the html files this also works. This seems like it may be a some permission error possibly? Any other ideas of what I am doing wrong? 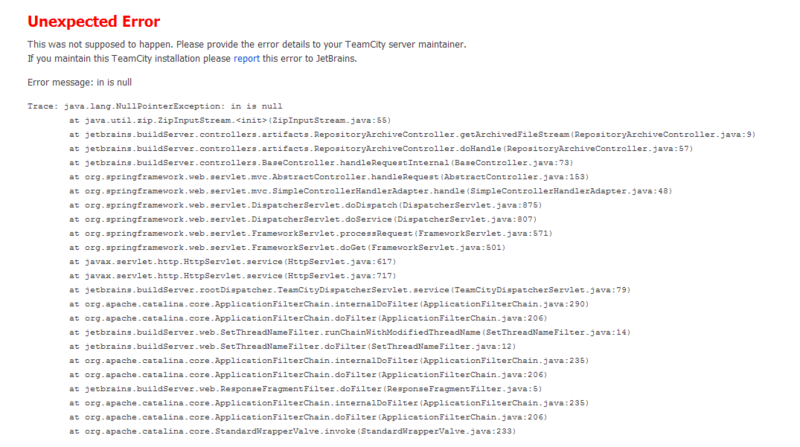 Please also take a look (or attach) at TeamCity server console or TeamCity/log/teamcity-server.log file. Most likely, TeamCity cannot find/open the artifact zip file. Ok dung a little deeper and it looks like the zipped artifacts were not zipped instead a folder was created. I have tried zip and rar with no success. TeamCity can zip artifacts on the fly only in the upcoming TeamCity 5.1 version, which is available in EAP. Till than, you have to prepare zip file manually.